Indonesia will begin mass poultry culling after three Indonesians died of bird flu, the government has said. The country's health minister said the source of Indonesia's first fatal cases could have been an infected farm 15km (9 miles) from where they lived. Siti Fadillah Supari said the farm's sick animals had been slaughtered, but in retrospect, its entire livestock should have been culled. 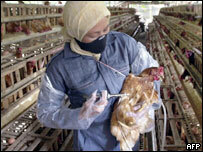 Bird flu has killed more than 50 people in South East Asia since January 2004. 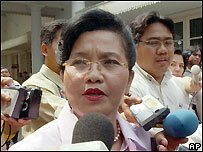 "We can't take any risks now," Indonesian Agriculture Minister Anton Apriyantono was quoted as saying. "If there is an animal on a farm that has contracted the virus, we will cull all livestock on the farm," he said. Ms Supari said that other emergency measures included preparing hospitals nationwide to treat bird flu patients, and close surveillance of people who had been in infected areas. When the case of Indonesia's first bird flu victims - a man and his two young daughters - was publicised last week, it initially raised fears of human-to-human transmission because the family had no known contact with poultry. But Ms Supari said it was "possible" the three had been infected by a virus on a farm in the vicinity of their home in Tangerang on the outskirts of the capital Jakarta. More than 300 people who had been in close contact with the family have been placed under medical surveillance. Indonesia has reported cases of bird flu in poultry in several provinces this year, and recently confirmed that a farm worker had tested positive for the virus. But until now there have been no human fatalities from the disease in the country. So far humans have only contracted bird flu after coming into contact with infected animals. But the real fear is that the virus might develop into a form which can be transmitted from person to person, raising the possibility of a global pandemic.